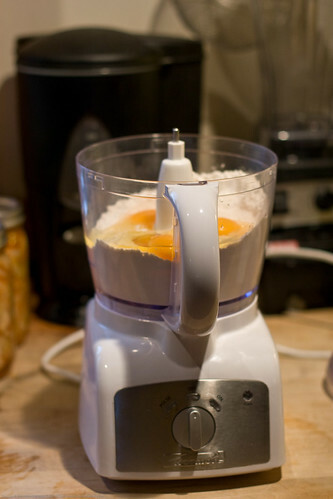 You are browsing the Blog for cooking. Recently I watched the entire series of “Upstairs Downstairs” as well as “Brideshead Revisted“. I also indulged in this truly fantastic series of videos on what it was like to be the cook staff in a Victorian kitchen. I guess I was trying to fill in for my craving for the next season of “Downton Abbey“. This excessive exposure to rich victorian British ways and means has left me with a slight obsession on tea services and victorian cuisine. I am sure it will pass in due course but in the mean time I decided to appease the odd yearning with just a bit of dainty food. This is extremely modest but I offer some spinach parmesan coddle eggs, buttery crunchy soldiers (toast sticks) and coffee in a dainty tea cup. You may or may not know about egg coddlers but I adore them. Mine are new but if you search online you will find many lovely antique ceramic coddlers as well as very fancy silver Victorian egg coddler get ups that would look good on any lace covered sideboard, ready for the Lordship and Ladyship to belly up to at breakfast time. With these ceramic coddlers you simply butter the interior, add an egg or two, ham or other delicious meat, herbs, salt, cream, what have you, cover the top, lower into boiling water so that the water just reaches the bottom of the metal cover and cook until done to your liking. Remove from the pot, keep warm, serve with toast sticks to dip into the soft boiled egg goodness inside! I promise to share a recipe for the most dreamy and crazy easy cream scones in the next week – hold onto your tea towels! 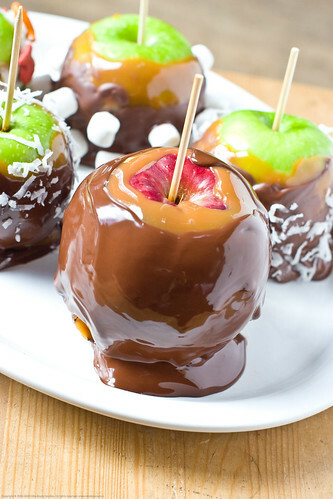 I will also be sharing a recipe for chocolate chip cheesecake and for these delicious caramel chocolate covered apples you see below. The very friendly people at General Mills and particularly Betty Crocker have invited me to come out to their test kitchens to take a stroll about, sit in on some classes they are running for us, and generally take a peek into a company that has been a part of American Food Loreâ„¢ for a very long time. You can learn a bit more about Betty Crocker and the kitchens below. Since 1921, the Betty Crocker name has symbolized General Millâ€™s continuing tradition of service to consumers. Although Betty was never a real person, her name and identity have become synonymous with helpfulness, trustworthiness and quality. It all began when a promotion for Gold Medal Flour offered consumers a pin cushion resembling a flour sack if they correctly completed a jigsaw puzzle of a milling scene. The Washburn Crosby Company, a forerunner of General Mills, received thousands of responses and a flood of questions about baking. “Betty Crocker” was created as a signature to personalize the responses to those inquiries. The surname Crocker was chosen to honor a popular, recently retired director the company, William G. Crocker. Betty was chosen simply as a friendly sounding name. Female employees were invited to submit sample Betty Crocker signatures; the one judged most distinctive is the basis for the one still in use today. During this same time period, the company expanded its commitment to consumer service and product quality by sponsoring cooking schools across the country. In fact, the company launched a radio show in 1924. Later named “The Betty Crocker Cooking School of the Air” the broadcast became one of the longest running shows in radio history. The growth of consumer demand for information necessitated the hiring of 21 home economists. 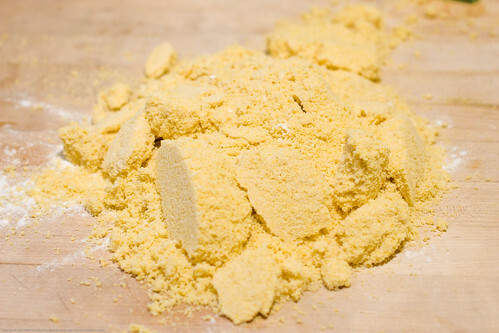 They were employed to carefully test and demonstrate the companyâ€™s gold medal-winning flour. This was the beginning of the Betty Crocker Kitchens. First housed in the Washburn Crosby A mill, the kitchens were full of then-modern facilities such as running water and gas stoves. The kitchens formally changed their name to â€œBetty Crocker Kitchensâ€ in 1946. When General Mills moved its headquarters to Golden Valley, MN in 1958, seven new kitchens were built, each one representing a different area of the United States: Arizona Desert, California, Cape Cod, Chinatown, Hawaiian, Pennsylvania Dutch, and Williamsburg. With the re-model of the kitchens in 2003, the entirely new facility features more than 7,000 square feet of kitchen space with 19 fully equipped individual kitchens designed for over 50,000 recipe tests each year. After the trip early next week, I will be coming back to blog about it here, share my photos and video, my impressions. Here is a little more information about the kitchens! The entirely new facility features more than 7,000 square feet of kitchen space with 19 fully equipped individual kitchens designed for over 50,000 recipe tests each year. Ergonomically designed workspace to accommodate the various needs of theBetty Crocker Kitchens staff. More than 1,500 linear feet of cabinets and storage rooms, including a walk-in pantry in which to store dry foods. Americaâ€™s largest corporate cookbook library, complete with 1,260 feet of high-density rolling book shelves for easy access. Eighteen tons of granite countertops. A uniquely designed conference room with a complete kitchen station in which to hold presentations and cooking demonstrations. A specially designed media kitchen that offers flexibility for a variety of broadcast uses and that features GE Profile appliances, Thomasville cabinetry and Corian countertops, all provided by The Home Depot. Makore, an African cherry veneer, on appliances and cabinetry, creates a warm and inviting atmosphere throughout the kitchens. A 375-square-foot, walk-in refrigerator and a 222-square-foot, walk-in freezer. Located in the newest addition to the General Mills, Inc., world headquarters, the space features a glass-encased observation balcony to view the Betty Crocker Kitchens staff at work. Atrium windows reaching two stories high to create an open and roomy atmosphere. The existing five state-of-the-art photography studios that handle the companyâ€™s extensive food photography bring the total number of General Mills cooking facilities to 24. Here is a video from inside the kitchen where GM food tasters are evaluating new recipes. Some foods, like homemade bread, are more than just “cooking” and can be more like therapy. 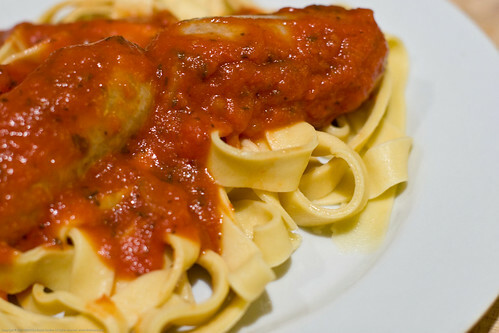 I was raised in a family where pasta was considered junk food, needless carbohydrates (obviously, we are not Italian or Asian!). In Colombia, the starch of choice is rice and various tropical starch crops like the ever delicious yuca (cassava root to Americans). 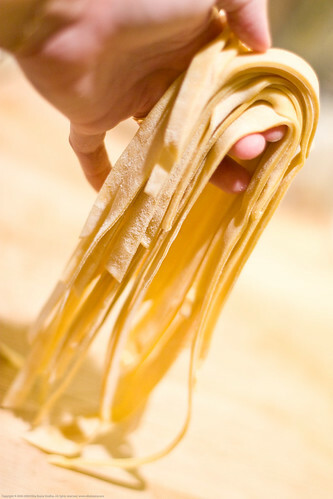 To shake things up and also to get some of that food therapy, I make homemade pasta on occasion. If you are interested in truly wholesome and healthy pasta, consider the sprouted whole wheat pasta I made in this post – Homemade Sprouted Whole Wheat Pasta. That recipes takes days so its for the organized cook! 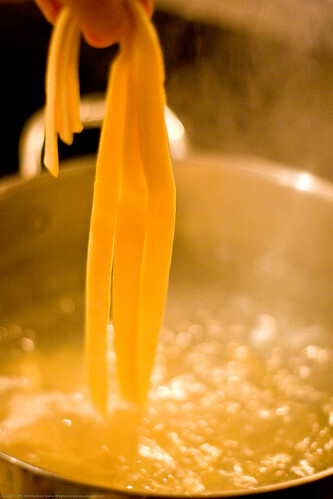 Sometimes you just want some delicious fresh pasta with little hassle and thats not hard. 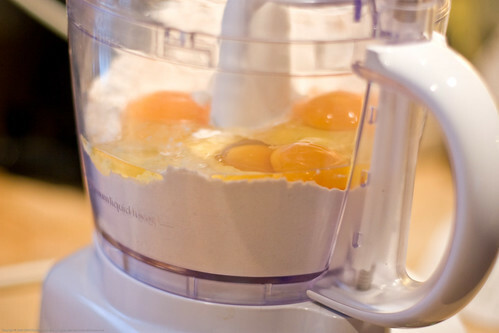 You can choose to do it all by hand or you can use a food processor. I show the use of a processor here. You can add additional nutrition (quickly) by using spinach puree, carrot puree, or other amendments to change the color and flavor. 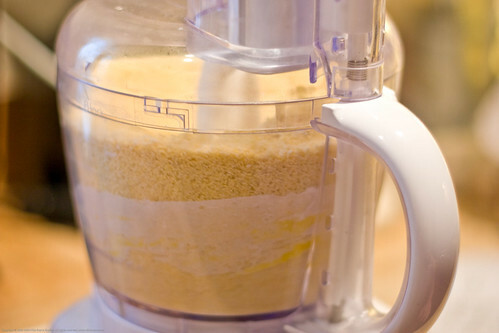 Put all ingredients (except water) into your food processor. Turn it on and let it go until you get smallish pea like dough. You want it to have some body and for it to stick together when you pinch it. I didnt add water until after I had dumped this mix out. I didnt want the water to overly activate the gluten formation in the dough (that leads to toughness!). 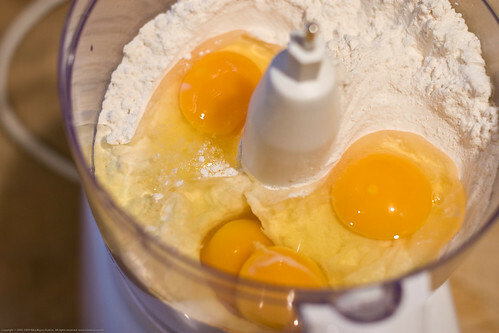 Bring the dough together and add 3 to 4 tablespoons of water. 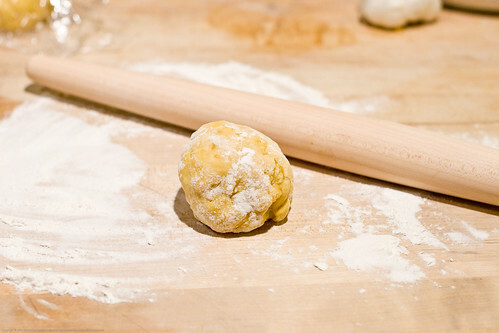 Knead dough for some 10 minutes to get it as smooth as you can. Mine was still a bit on the rough side but I went ahead to the next step. Put this dough into a baggie or wrap in plastic and let sit at room temperature for 30 to 60 minutes. 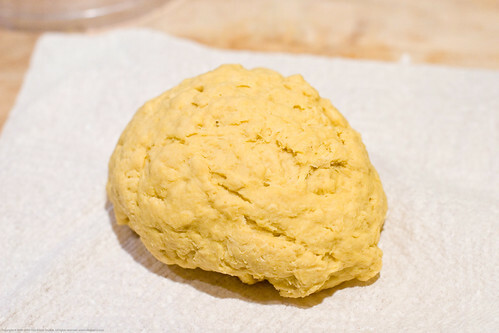 Once the dough has rested, cut into 4 pieces and roll out each piece while the rest is still under wraps. Roll it out as thin as you possibly can. 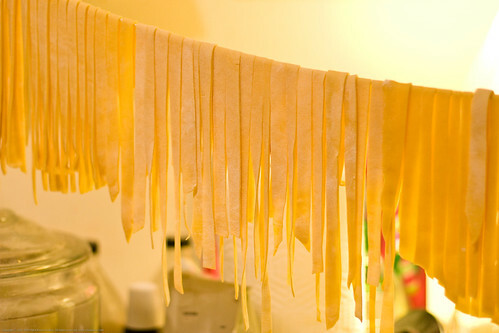 You can also use a pasta machine! I cant use mine because it has polymer clay stuck in it :-(. Once rolled out, cut it as you like. 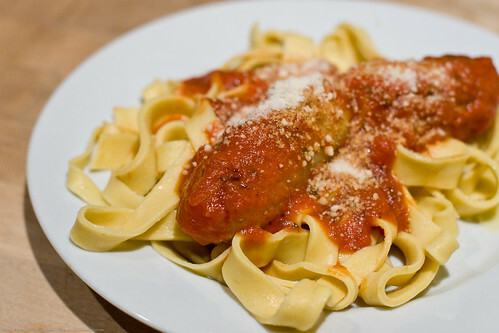 I cut ours into a fettuccine sort of noodle. I am sure an Italian grandma would beat me about the head and shoulders and throw me out of the kitchen if she saw this but, hey, she never met my grandma nor made arepas either. 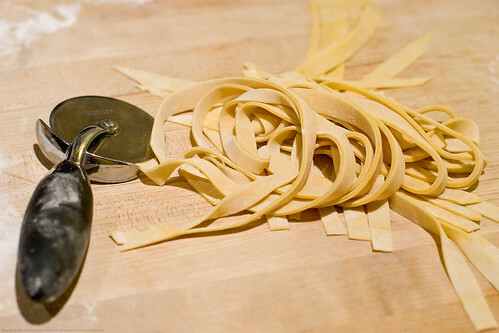 I use a pizza cutter to make my pasta strips. My 6 yo and my 3 yo helped me cut it all up. They loved helping out. 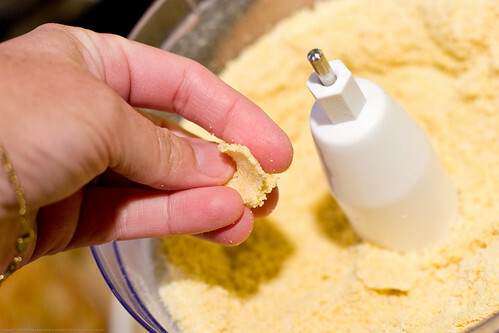 Hang up these dough strips while you roll out and cut the other balls. Next its into salted boiling water. 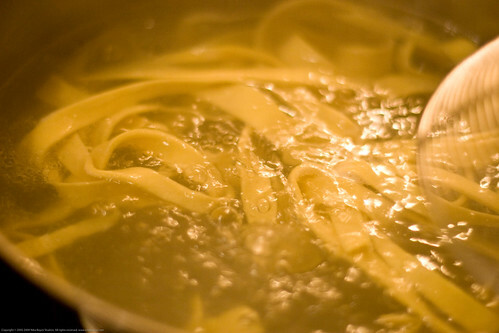 Boil it until it has the texture YOU like. 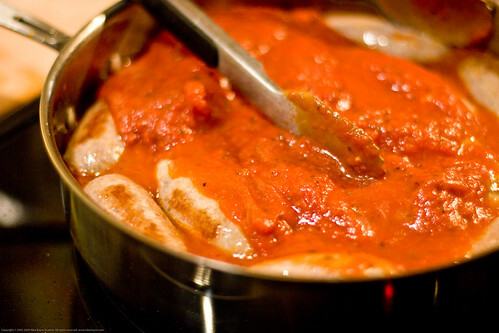 Have your sauce and meat (we chose sausages) warming and ready to serve. Serve and add some Parmesan if you like.